New Custom T-shirt Colors are something everyone should check out if they are wanting to make a splash with their next custom t-shirt design. Whether you are in marketing, branding, or you simply want a unique colored t-shirt for your next family reunion, these new custom t-shirt colors are worth the look. Mint Green is by far the most popular new color and the proof is in the fact that multiple manufacturers have now come out with a mint green once Gildan launched in this year. It’s a great color that allows for many compliments of various ink colors to be printed on it. It comes in a lot of styles now and even the fashion brands like Next Level are on board with their own varation of mint green. Another popular new custom t-shirt colors are the oranges. While the neon safety oranges will never go out of style, especially thanks fo OSHA, but orange is always a popular color for fall. Now you can add Sunset which is a blended orange and lighter colors of thread giving an orange heathered look. Another orange shade is the antique orange which is your basic orange thread blended with a dark thread. Both colors are popular mostly because they are new. Other new custom t-shirt colors are gravel, a solid grey, cobalt, a rich dark blueish purple,old gold which is a rare find, and coral silk which is a heather coral. Coral has become a popular color over the past couple of years and now it’s just a heathered variation sure to make the coral color trend last. Now, when it comes to picking the right t-shirt color something new is always a strong way to go. Something that you don’t see everyday is sure to catch some eyes which means you message will be seen prominantly. When it comes to picking a color you definitely want to have a complimentry ink color to give the shirt maximum pop. Something that is ethically pleasing obviously garners more looks than something that just blends in. 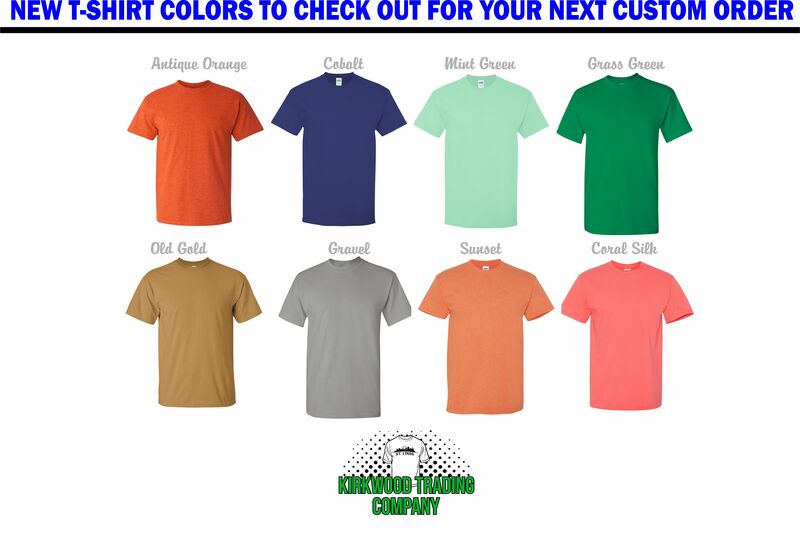 At Kirkwood Trading Company we help you match ink colors to the shirt color of your choice so you get maximum exposure. That’s the point right? To get people to see your t-shirt. That’s where we come in. We’ll make sure that when we print you custom t-shirts that your message pops.